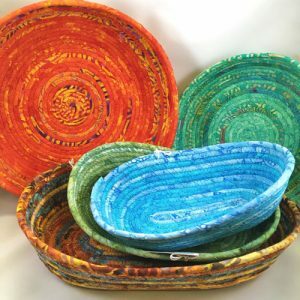 These vibrant, brightly colored baskets by Annie Chittenden are made using strips of hand-cut, hand-dyed or hand-painted fabrics. This CT-based artist folds, presses and wraps the fabric around a solid cord, producing baskets of different sizes and shapes. Perfect for decorating or use in any room in the house that needs some attractive organization!